Browns analyst Tony Grossi joined Aaron Goldhammer and Mike Rizzo to debate whether the Browns are legitimate Super Bowl contenders. Tony Grossi tells Aaron Goldhammer that the Browns are focused on defense in the 1st round of the 2019 draft. Could they select another Buckeye this year at number 17? ESPN's Seth Greenberg joined Aaron Goldhammer and Mike Rizzo to discuss Zion Williamson's injury and the 2019 NBA Draft class. Former Browns RB Trent Richardson joined Aaron Goldhammer and Tony Grossi to discuss what he remembers about the day he was traded by the Browns. Former Browns LT Joe Thomas joined Rizz and Hammer on Tuesday to discuss the pros and cons of the Browns controversial decision on Kareem Hunt. ESPN NBA analyst Brian Windhorst joined Rizz and Hammer to discuss Kevin Love's future with the Cavs. Indians' analyst Rick Manning joined Aaron Goldhammer to discuss playing for Frank Robinson and his legacy in Cleveland. The Athletic's Joe Vardon joins Aaron Goldhammer to discuss Kevin Love's future and when fans can expect him back on the court. Browns analyst Tony Grossi joined Rizz and Hammer to react to Dan Graziano's prediction that the Browns will win the AFC North in 2019. Tony Grossi joins Rizz and Hammer to discuss Baker Mayfield's commercial during the Super Bowl and whether the Browns should want the Patriots on "ring night" to open 2019. Zach Lowe joined Rizz and Hammer to discuss Kyrie drama and Anthony Davis' future. Former Browns LT Joe Thomas joined Rizz and Hammer to discuss what the Browns can learn from the Rams rebuild to the Super Bowl. Browns analyst Tony Grossi joined Rizz and Hammer to explain his reasoning in dismissing the possibility of a Von Miller trade to Cleveland. ESPN Senior NFL writer Seth Wickersham joined Rizz and Hammer to discuss his bombshell article about the Haslam family chaos in Berea. Browns head coach Freddie Kitchens joined Rizz and Hammer to tell the story of how the team offered him the job and discuss the Browns ultimate goal. Tony Rizzo opens Thursday's show on unloads on the Cavs after their awful performance against the Blazers. Former Browns RB Eric Metcalf joins Rizz and Hammer to talk about his impressions of Freddie Kitchens and his expectations for the 2019 season. ESPN's Adam Schefter joined Rizz and Hammer to discuss the Browns' playoff chances and the scenario under which the Steelers would trade Antonio Brown to Cleveland. Tony Rizzo, Aaron Goldhammer, and Tony Grossi discuss whether Baker Mayfield had significant influence on the Browns coaching hire. NFL Network's Chris Rose joined Rizz and Hammer in the wake of the hiring of Freddie Kitchens to discuss Gregg Williams' legacy as a Browns coach. Former Browns LT Joe Thomas joins Rizz and Hammer to discuss why he's advocating for Cleveland to strongly consider Freddie Kitchens for head coach. Former Browns kicker Phil Dawson joined Rizz and Hammer to discuss his love for the Dawg Pound and whether he'd ever kick in Cleveland again. Pro Football Talk's Mike Florio joins Rizz and Hammer to discuss the possibility of a shocking turn in the Browns coaching search. Browns analyst Tony Grossi joined Rizz and Hammer on Thursday to discuss the interview of former Lions and Colts coach Jim Caldwell. Is he a legitimate candidate? Tony Rizzo and Aaron Goldhammer open Wednesday's show debating whether Gregg Williams is a serious candidate for the Browns' coaching job. CBS Sports announcer Jim Nantz joined Rizz, Hammer, and Tony Grossi to preview Sunday's game against the Ravens. Aaron Goldhammer addresses the criticism of Baker Mayfield and explains why he's far and away the Rookie of the Year. Joe Thomas joined RBS to talk about the Browns coaching search and the job Gregg Williams has done. Plus, the growth of Baker Mayfield while working with Freddie Kitchens. Voice of the Browns, Jim Donovan, joined Rizz to talk about the coaching search John Dorsey is leading and how Gregg Williams has improved his odds to be the next head coach. NFL Hall of Fame QB Kurt Warner joined Rizz to talk about how the Browns look to be turning things around and how they are viewed by the rest of the NFL. 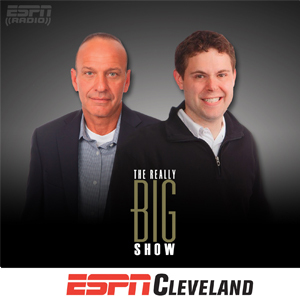 Sports Time Ohio's Jensen Lewis joined Rizz to talk about the trade rumors involving Corey Kluber and Trevor Bauer and why it makes business sense to listen to the offers. Voice of the Browns, Jim Donovan, joined Rizz to talk about the continued growth and development of Baker Mayfield and how he has 'total belief' in his ability when playing. Who do Rizz, Hammer, and Tony Grossi think will win on Sunday? Could the Browns beat Cam Newton and the Panthers? Rizz, Hammer, and Emmett Golden discuss the vibe inside The Q during the Cavs vs Warriors game. ESPN's Jesse Palmer joined Rizz and Hammer to discuss the coaching change at Ohio State and Ryan Day's future in the Big Ten. Tony Rizzo and Aaron Goldhammer open Tuesday's show and react to the news that Urban Meyer is stepping down at Ohio State. Browns play-by-play announcer Jim Donovan joined Rizz and Hammer to discuss the state of the Browns' coaching search. Does Gregg Williams stand a chance to getting the job? Tony Rizzo and Tony Grossi predict Sunday's game against the Texans. Can Baker Mayfield end Houston's winning streak? ESPN NBA analyst Brian Windhorst joined Rizz and Hammer to discuss Colin Sexton's play through the first 20 games of his career. Is he a potential all-star? Former Browns LT Joe Thomas joins Rizz and Hammer for his weekly segment to discuss Baker Mayfield's snub of Hue Jackson and why their relationship deteriorated. Browns analyst Tony Grossi joined Rizz and Hammer to discuss the win over the Bengals and Baker Mayfield's relationship with Hue Jackson. ESPN/ABC NBA analyst Doris Burke joins Aaron Goldhammer and Chris Oldach to discuss LeBron's return to Cleveland and reminisce about Cleveland's 2016 championship. Former Browns LT Joe Thomas joins Aaron Goldhammer and Tony Grossi to discuss how hiring Lincoln Riley might present an odd dynamic for the Browns locker room. Browns analyst Tony Grossi joined Aaron Goldhammer and Chris Oldach to discuss Adam Schefter's report about the Browns interest in a coaching interview with Condoleezza Rice. Aaron Goldhammer and Tony Grossi discuss the connections between the Browns and the Packers and whether Cleveland would interview Mike McCarthy if he's fired in Green Bay. Browns GM John Dorsey joined Aaron Goldhammer and Chris Oldach to discuss the coaching search and Baker Mayfield's play thus far. Aaron Goldhammer and Chris Oldach discuss Browns GM John Dorsey's press conference and whether he's seriously considering Gregg Williams for full time head coach. Browns DB T.J. Carrie joined Rizz and Hammer to celebrate Victory Monday and discuss whether the team should consider keeping Gregg Williams for 2019. Fox Sports' Gus Johnson joins Rizz and Hammer to talk Browns and preview OSU vs Michigan State. Browns analyst Tony Grossi joined Rizz and Hammer to discuss whether the Browns would consider John Harbaugh as their next coach if he's fired in Baltimore. ESPN's Brian Windhorst joined Rizz and Hammer to discuss the Cavs dysfunction and whether they'd consider dealing Kevin Love. Former Browns LT Joe Thomas joined Rizz and Hammer on Tuesday to discuss the latest reporting regarding the Browns dysfunction between Hue Jackson and Todd Haley. Browns play-by-play analyst Jim Donovan joined Rizz and Hammer to recap the loss to the Chiefs and discuss the Browns coaching search. Rizz, Hammer, and Tony Grossi discuss Hue Jackson's interview on First Take on ESPN. Pro Football Talk's Mike Florio joined Rizz and Hammer to reveal his top candidates for the Browns coaching search. Rizz and Hammer react to Baker Mayfield's press conference following the firing of Hue Jackson and debate how his play will be effected. Former Browns LT Joe Thomas joined Rizz and Hammer on Tuesday to discuss the firing of Hue Jackson and whether Cleveland erred in bringing him back for 2018. Rizz and Hammer react in the moment to the breaking news that Hue Jackson had been fired by the Browns. Steelers CB Joe Haden joined Rizz and Hammer on Friday to discuss his tenure in Cleveland and explain why the team couldn't win when he played for the Browns. ESPN's Paul Finebaum joined Rizz and Hammer on Thursday to talk about Urban Meyer's future at Ohio State and potentially, in the NFL. Browns analyst Tony Grossi joined Rizz and Hammer on Wednesday to discuss what ails the Browns offense and the future of Hue Jackson. Browns legend Joe Thomas joined Rizz and Hammer to discuss Cleveland's struggles to win close games and who is to blame. Voice of the Browns, Jim Donovan, joins Rizz and Hammer to recap the loss to the Bucs and discuss Hue Jackson's job status. ESPN Cleveland's Tony Rizzo opens Thursday's show criticizing Browns safety Jabrill Peppers. Indians GM Mike Chernoff joined Rizz and Hammer to discuss Cleveland's decision to begin the playoffs with Trevor Bauer in the bullpen. Former Browns OL Joe Thomas joined Rizz and Hammer on Tuesday to discuss the heart-breaking loss to the Raiders and the future of head coach Hue Jackson. Browns play-by-play man Jim Donovan joined Rizz and Hammer on Monday to talk about the heartbreaking loss to the Raiders and discuss Hue Jackson's future. Browns analyst Tony Grossi and the rest of the RBS crew make their picks for the Browns vs Raiders game. Oklahoma coach Bob Stoops joined Rizz and Hammer to discuss where he watched Baker Mayfield's debut and how he thinks he'll handle the starting role. Former Browns OL Joe Thomas joins Rizz and Hammer to discuss the future of QB Tyrod Taylor. Browns analyst Jim Donovan joined Rizz and Hammer to discuss Cleveland's dramatic win over the Jets and the future of their quarterback depth chart. Former Browns OL Joe Thomas joined RBS to announce his weekly appearance on the show and discuss the future of head coach Hue Jackson. Browns analyst Tony Grossi joined Rizz and Hammer to discuss the Browns QB situation and the match-up with the Saints. Browns analyst Tony Grossi joined Rizz and Hammer to discuss the state of the Browns QB room after the opening tie against Pittsburgh. Rizz and Hammer open Wednesday's show explaining why this is the biggest Browns game of the last decade. Rizz and Hammer react to Aaron's season prediction: The Browns will go 6-10 this year. Browns analyst Tony Grossi joined Rizz and Hammer to discuss which would come first for the Browns: A QB change or a coaching change? Browns analyst Tony Grossi joins Rizz and Hammer to discuss Baker Mayfield's pre-season performance and how long fans will have to wait until he's ready to start. Tony Rizzo opens Friday's show with some brutal honesty: Might Baker Mayfield give the Browns a better chance to beat the Steelers than Tyrod Taylor? Browns analyst Tony Grossi joined Rizz and Hammer on the day of the pre-season finale to discuss Baker Mayfield's progress. Rizz and Hammer open Friday's show discussing Dez Bryant's visit to Cleveland and whether the Browns have a need at receiver. Rizz and Hammer compose and read poems related to Browns DE and poet, Myles Garrett. Browns analyst Tony Grossi joined Rizz and Hammer to discuss the relationship between the Cleveland's assistant coaches and Hue Jackson. Browns OT Joel Bitonio joined Aaron Goldhammer on Monday to talk about his debut at left tackle and how he's transitioning to a new position. ESPN's Paul Finebaum joined Rizz and Hammer on Thursday to discuss Urban Meyer's future at Ohio State. Tony Rizzo opens Wednesday's show talking about Antonio Callaway, Urban Meyer, and the plight of an Ohio football fan in 2018. SportsTime Ohio's Rick Manning joined Rizz and Hammer to discuss Trevor Bauer dominance for the Indians and the recent bullpen additions. Browns analyst Tony Grossi joined Rizz and Hammer to discuss the Corey Coleman trade and what it means for the other wide receivers. Former Ravens coach Brian Billick joined Rizz and Hammer to talk about how the Browns will know when Baker Mayfield is ready to play. Tribe Insider Anthony Castrovince joined Rizz to recap the MLB trade deadline, how the Indians can still improve the team, and how they stack up against other AL teams. Browns analyst Tony Grossi joined The Really Big Show to share the latest on the team's wide receivers through five days of camp. Plus, the leadership of Jarvis Landry. Indians analyst Jensen Lewis joined Rizz and Hammer on Thursday morning to discuss where Brad Hand fits in the Indians' improved bullpen. Browns head coach Hue Jackson joined Aaron Goldhammer & Chris Oldach to explain the move of bringing in offensive coordinator Todd Haley and the development of Baker Mayfield. Indians analyst Anthony Castrovince joined Aaron Goldhammer and Tony Grossi to evaluate the Indians status after the first half of the season. Aaron Goldhammer and Chris Oldach discuss taking down the LeBron James banner and how it feels losing something that was ingrained in the city's history. ESPN's Brian Windhorst joined Aaron Goldhammer and Chris Oldach to discuss LeBron's move to LA and why he signed longer term than he ever did with Cleveland. Tony Rizzo and Aaron Goldhammer discuss how memories of the Cavs championship would be different if LeBron played for the Lakers and Kyrie played for the Celtics. Tony Rizzo and Aaron Goldhammer play the winning clips from Wednesday's contest for spots in the 2018 RBS Open at Shale Creek. Tony Rizzo and Aaron Goldhammer discuss LeBron's free agency and Rizz rants about how emotionally draining it's been on him as a fan. ESPN NBA analyst Brian Windhorst joined Rizz and Hammer to discuss the Cavs selection of Collin Sexton in the NBA Draft. ESPN College Basketball analyst Jay Bilas joined Rizz and Hammer to discuss the Cavs options with the 8th pick in the draft. Rizz and Hammer read emails from fans and reminisce about where they were when the Cavs won the championship and broke the Cleveland sports curse two years ago today. ESPN's Brian Windhorst joined Rizz and Hammer to explain what the Cavs can do on draft night to help convince LeBron James to stay in Cleveland. Cleveland.com Cavs insider Paul George joined Aaron Goldhammer and Chris Oldach on Friday to talk about NBA free agency and way the Cavs could acquire all star Paul George. ESPN NBA draft analyst Michael Schmidtz joined Rizz and Hammer to discuss the Cavs options with the 8th pick in next week's draft. Browns LB Christian Kirksey joined Aaron Goldhammer and Chris Oldach to talk about the new and improved Browns during mini-camp. ESPN's Brian Windhorst joins Rizz and Hammer to go over LeBron's free agency options and discuss what he might do next. ESPN Cleveland's Tony Rizzo goes off on a rant about everyone trying to argue that Kevin Durant is as good as LeBron James. ESPN Cleveland's Tony Rizzo reacts to the Cavs loss in game three and speculates on what's coming with LeBron this summer. ESPN/ABC NBA announcer Mike Breen joined Rizz and Hammer to explain his perspective on J.R. Smith's mistake at the end of game one. Brian Windhorst shares his thoughts on the video that has surfaced that shows the Cavs huddle after JR Smith's blunder in Game 1 of the NBA Finals and what followed in OT. ESPN NBA analyst Jeff Van Gundy joined Rizz and Hammer to discuss the officiating controversy in game one and how it will impact the series going forward. Tony Rizzo and Jerod Cherry tell you if LeBron James is good enough to carry the Cavs past the Warriors to win another NBA championship for Cleveland. Cavs analyst Brian Windhorst joined Rizz and Hammer to recap the game seven win over the Celtics and preview the 2018 NBA Finals. Rizz and Hammer open Thursday's show disappointed about the Cavs loss to the Celtics in game five. Rizz and Hammer open Tuesday's show talking about the big win over the Celtics in the game four. Is another NBA Finals appearance on the horizon? Browns RB Duke Johnson and LB Christian Kirksey join Rizz and Hammer to discuss Cleveland's upcoming appearance on Hard Knocks. Browns analyst Tony Grossi joined Rizz and Hammer to discuss the Browns upcoming appearance on HBO's Hard Knocks. NBA legend Charles Barkley joined Rizz and Hammer to discuss the Cavs struggles against the Celtics and debate LeBron's future. ESPN NBA analyst Brian Windhorst joined Rizz and Hammer to discuss sports betting and recap the Cavs disappointing performance in game one. NBA legend Kareem Abdul-Jabbar joined Rizz and Hammer to promote his upcoming visit to Cleveland and reminisce about his only professional three-pointer. ESPN Cleveland's Tony Rizzo takes time to dream about what would happens if everyone goes right for the Browns. Clemson coach Dabo Swinney joined Rizz and Hammer to get his impressions of Baker Mayfield and Nick Chubb. Clemson coach Dabo Swinney joined Rizz and Hammer to describe his experience as a fan watching LeBron in Cleveland for a playoff game. Cavs analyst Brian Windhorst joined Rizz and Hammer to discuss LeBron's dominance over the Raptors and where his buzzer beater in game three ranks among his most memorable. Browns GM John Dorsey joined Rizz and Hammer on Wednesday to recap the draft and discuss to possibility of the Browns ending up on Hard Knocks on HBO this year. ESPN NBA analyst Brian Windhorst joins Rizz and Hammer to recap Cleveland's win in game seven and preview the series against the Raptors. Browns analyst Tony Grossi joined Rizz and Hammer to sum up his feelings about the Browns draft and discuss when Baker Mayfield will play in a regular season game. Former Oklahoma coach Bob Stoops joined Rizz and Hammer to talk about how he felt when his hometown Browns selected his quarterback, Baker Mayfield, with the first pick. Tony Rizzo opens Friday's show with his take on Baker Mayfield, Denzel Ward, and an exciting Browns draft. Browns play-by-play broadcast Jim Donovan joined Rizz and Hammer to react to the rumors that the Cleveland will select Baker Mayfield at number one. Tony Rizzo opens Wednesday's show by equating the 2018 draft to LeBron's homecoming. CBS Sports legend Jim Nantz joined Rizz, Hammer, and Tony Grossi to preview the draft and talk about his relationship with Cleveland and Browns fans. Brian Windhorst joins Rizz and Hammer to discuss LeBron's attitude in games three and four of the series against the Pacers. Tony Rizzo and Aaron Goldhammer opened Friday's show by previewing the Cavs' game with the Pacers and debating whether the Browns opening with Pittsburgh is good or bad news. NC State's Bradley Chubb joined Rizz and Hammer to explain what he thinks it means that the Browns didn't schedule a visit with him in Cleveland. Tony Rizzo and Aaron Goldhammer opened Monday's show recapping the loss to the Pacers in game one. Cavs analyst Brian Windhorst joined Rizz and Hammer to discuss LeBron's attitude during the game one loss to the Pacers. ESPN NBA analyst Jeff Van Gundy joined Rizz and Hammer to preview the 2018 NBA playoffs. Tony Rizzo and Aaron Goldhammer discuss LeBron's minutes load and whether it means something to him to play in all 82 games this year. Browns analyst Tony Grossi joined Rizz and Hammer to discuss what he's learned in the last week about the Browns upcoming QB decision in the draft. Indians president Chris Antonetti joined Rizz and Hammer on Opening Day to preview the season and discuss the possibility of a new Indians logo. Brian Windhorst joined Rizz and Hammer to discuss whether LeBron or James Harden should win the 2018 MVP award. ESPN SportsCenter anchor Scott Van Pelt joined Rizz and Hammer to preview the 2018 Masters and discuss the worst "Bad Beat" he's ever seen. ESPN MLB analyst Buster Olney joined Rizz and Hammer to talk about the season opener and the Francisco Lindor's future with the team. ESPN NBA analyst Brian Windhorst joined Rizz and Hammer to discuss whether LeBron can still win the MVP and preview a big week for the Cavs. NBA legend Ray Allen joined Rizz and Hammer to discuss why he never played with LeBron James in Cleveland and promote his new book. ESPN College Football analyst Booger McFarland joined Rizz and Hammer to discuss quarterback pro days and Baker Mayfield. Browns analyst Tony Grossi joined Rizz and Hammer to preview Josh Allen's pro day and discuss the Browns' wild week of quarterback workouts. Browns analyst Tony Grossi joined Rizz and Hammer to recap Sam Darnold's pro day and discuss Baker Mayfield's draft documentary. Tony Rizzo returns from his vacation to explain why he's sure the Browns are going to select a quarterback with the number one pick in the draft. Browns analyst Tony Grossi and co-host Aaron Goldhammer discuss whether the another Browns player will ever wear number 73. Browns play-by-play announcer Jim Donovan joined Aaron Goldhammer and Chris Oldach to discuss the implications of the Tyrod Taylor trade. NFL Network's Chris Rose joins Rizz and Hammer to discuss the Browns' options at the top of the 2018 draft. MMQB's Peter King joined Rizz and Hammer to discuss how the draft landscape changed after the NFL combine. Cavs analyst Brian Windhorst joined Rizz and Hammer to discuss why the Cavs are so much better without Tristan Thompson. Browns analyst Tony Grossi joined Rizz and Hammer to talk about Cleveland's options for a free agent quarterback. Rizz and Hammer discuss their major takeaways from their trip to Indianapolis for the NFL Combine. Browns GM John Dorsey joins Rizz and Hammer at the NFL Combine to discuss how he evaluates quarterbacks. Olympian Red Gerard joined Rizz and Hammer on Tuesday to talk about his gold medal winning run and his experience in South Korea. ESPN's Brian Windhorst joins Rizz and Hammer to talk about LeBron's all-star performance and preview the second half of the season. CBS College Football analyst Gary Danielson joined Rizz and Hammer on discuss AJ McCarron's NFL future. Browns analyst Tony Grossi joined Rizz and Hammer to talk about the state of the team's WR position. Tony Rizzo and Aaron Goldhammer discuss how they'd feel if the Browns sign QB AJ McCarron in free agency. Cavs GM Kobe Altman joined Rizz and Hammer to discuss the recent roster overhaul and the team's plans for the future. Rizz and Hammer open Friday's show with their take on the flurry of Cavs trades and how they'll affect LeBron's future. NFL Network's Mike Mayock joined Rizz and Hammer to discuss the upcoming draft and the QB class. Former Oklahoma Coach Bob Stoops joined Rizz and Hammer to discuss Baker Mayfield's transition to the NFL and how he'd fit in Cleveland. ESPN's Brian Windhorst joins Rizz and Hammer to discuss the embarrassing loss in Orlando and the future of LeBron James. NFL Network host Chris Rose joined Rizz and Hammer to discuss his experience interviewing Sam Darnold and Baker Mayfield during Super Bowl week. Cavs analyst Brian Windhorst joined Rizz and Hammer to discuss Cleveland's embarrassing losses and explain the complicated relationship between LeBron James and Dan Gilbert. ESPN NBA Insider Bobby Marks joined Aaron Goldhammer to discuss the trade deadline and the latest LeBron rumors. Browns analyst Tony Grossi joined Aaron Goldhammer to discuss the odds of Kirk Cousins signing with the Browns. Cavs analyst Brian Windhorst joined Aaron Goldhammer to discuss the recent struggles of Cavs guard Isaiah Thomas. Indians legend Omar Vizquel joined Aaron Goldhammer and Tony Grossi to react to the Indians' decision to remove Chief Wahoo from team uniforms. Hall of Famer Kurt Warner joined Rizz, Hammer and Tony Grossi to discuss the Browns' hire of Todd Haley. Former Indians manager Mike Hargrove joined Rizz and Hammer to commemorate Jim Thome's induction into the Hall of Fame. ESPN's Brian Windhorst joined Rizz and Hammer to discuss Cleveland's ongoing drama and the status of head coach Ty Lue. Former Browns RB Ernest Byner joined Tony Rizzo and Tony Grossi to reminisce about his conference championship appearances and give advice to Saints defender Marcus Williams. ESPN NBA analyst Tim Legler joined Rizz and Hammer after the Cavs loss to the Warriors to discuss Cleveland's struggles and who is most to blame. Former Browns GM and Senior Bowl Executive Director Phil Savage joined Aaron Goldhammer and Tony Grossi to discuss Cleveland's decision to decline coaching in Mobile. Browns analyst Tony Grossi joined Aaron Goldhammer and Chris Oldach to discuss the Browns' ongoing flirtation with Nick Saban. Indians manager Terry Francona joins Rizz and Hammer on Friday to talk about the future of the roster and how the Tribe will combat the loaded Yankees lineup. Sirius XM NFL analyst Ross Tucker joined Rizz and Hammer and discussed whether the Browns would be smart to pursue Kirk Cousins in free agency. With the Browns at 0-16, Tony Rizzo and Aaron Goldhammer lament the lack of a Victory Monday in 2017 and they reenact how one win might have sounded on the show. Tony Rizzo losses his temper with Hue Jackson and the idea he could return if the Browns don't win a game. Rizz and Hammer discuss whether DeShone Kizer has lost his confidence and how much Hue Jackson is the blame for his struggles. Pro Football Talk's Mike Florio joins Rizz and Hammer to discuss Hue Jackson's job status and whether he's more likely to stay in Cleveland or leave for the Bengals. Browns analyst Tony Grossi joins Rizz and Hammer to recap the loss to the Ravens and discuss Hue Jackson's future. Browns analyst Tony Grossi joins Rizz and Hammer for the NFL Roundtable and discusses whether Cleveland would reverse course and fire Hue Jackson. Browns GM John Dorsey joined Aaron Goldhammer to discuss the state of the team and the future of Hue Jackson. ESPN Cleveland's Tony Rizzo reacts to John Dorsey's introductory news conference. ESPN's Adam Schefter joined Aaron Goldhammer to discuss the firing of Browns VP Sashi Brown.